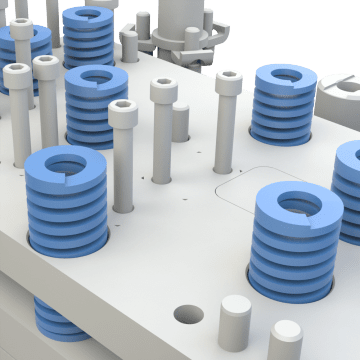 While standard compression springs are made from round wire, die springs are made from rectangular or trapezoidal wire, which provides more resistance to compressive force and allows the springs to compress to a smaller size. They provide minimal compression in demanding applications with heavy loads and high shock stresses and are commonly used in clutches, brakes, stamping tools, dies, jigs, and punch presses. 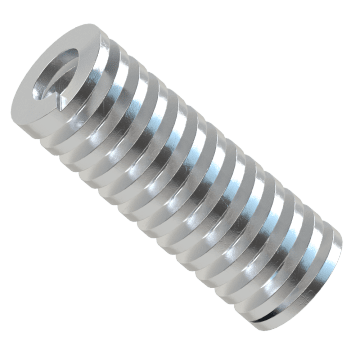 These die springs are made from chrome-silicon steel for high strength and durability in applications with high static loads, shock stresses, or repetitive cycles. The springs have a paint finish and are color-coded by duty rating so you can quickly find the spring you need for your task: blue is for medium duty, red is for medium- to heavy duty, gold is for heavy duty, and green is for extra-heavy duty. Manufactured to ISO 10423 specifications, these die springs can be used interchangeably with die springs from other manufacturers that have the same size, type, and duty rating. 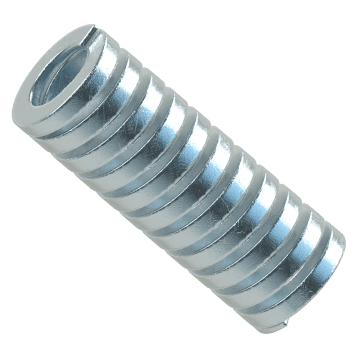 They are made from chrome-silicon steel for high strength and durability in applications with high static loads, shock stresses, or repetitive cycles. The springs have a powder coat finish, which is more durable than a paint finish, and are color-coded by duty rating so you can quickly find the spring you need for your task: olive green is for ultra-light duty, green is for light duty, blue is for medium duty, red is for heavy duty, yellow is for extra-heavy duty, and silver is for ultra-strong duty.